Brandon Wells is a photographer, song-writer, and natural bodybuilder who lives in Texas. 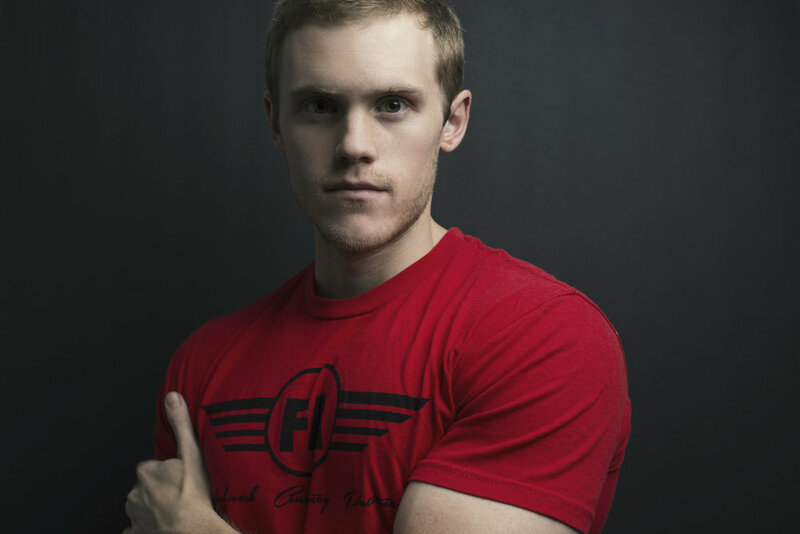 He has used his creative skills to work with fitness professionals and brands such as 3DMJ, The Strength Athlete, SF Crossfit, and many more. He loves capturing a whole new perspective through the lens of a camera, and continually finding ways to turn ideas into the ideal. Matt: Can you tell a little bit about when you first started to become interested in health and fitness? When did it become a bigger part of your life? Brandon: My dad was one of the first people to introduce me to fitness. He was a competitive bodybuilder back in the 80s, but he stopped for a while to venture off into a few other interests and hobbies. His participation in the competitions always inspired me as a kid. Myself, I was always the skinny kid so I really looked up to him. I remember looking at the football players before I entered high school and wishing I could do that. As a teenager I was only 5’9” and weighed around 130 pounds so that wasn’t the path for me. After high school one of my friends got into online coaching and was looking for clients. He made a structured plan for me and I followed it for close to a year. From there I simply started to look for additional information and connect with online fitness communities. Around that time, in 2011, I started training with Coach Matt Ogus and we worked together over the next few years. Eventually I decided to do a bodybuilding show and had a lot of fun going through the process. Fitness has been an important part of my life ever since. Matt: Was there anyone that was particularly helpful, either online or in-person, in those early days? Brandon: My friend who initially helped me get started and Matt Ogus, but other than that there wasn’t much. I didn’t have a lot of knowledge in the area so it was really hard for me to figure out what to do and who to listen to as a fitness consumer. After a while I came across the 3DMJ team who followed a science-based approach and I thought what they did was amazing. I had seen a ton of conflicting info in the bodybuilding space put out by people attempting to sell ebooks and products before this. I never really bought into any of that, but until 3DMJ I didn’t have a source to look at that I could really trust besides my coaches. Matt: How long have you been interested in photography and other creative endeavors? Brandon: I’ve been interested in creative skills and hobbies my entire life. As a kid I was really into art and in sixth grade I received my first guitar. Music pretty much took over my life until the end of high school. I thought I would become a musician one day and put all my eggs in that basket, you know? When I got into weight training I started to put a little less time into music. I got into photography in early 2012 right when people in the fitness space were starting to build audiences on YouTube. I wanted a nice video camera to do video blogs of my own and started to do research. It turned out that DSLR’s at that time were better for video than your normal video cameras on the market. I was very much a tech-nerd so I wanted to know everything there was to know about using the camera. As a result, I started to do more photos instead of just videos because I liked the using the camera for what it was built for. Once I started I became hooked and haven’t stopped working to improve my photography skills. Matt: Was the video blog you mentioned something that helped you began to build connections and eventually what led to you starting to do gigs of your own? When did it start to become a real business for you? Brandon: Things started to snowball after doing the video blogs for a while. The YouTube videos were more for personal documentation than building an audience, so the online fitness communities I’d interacted with are what really helped me get started with my business. In these online communities, such as 3DMJ’s, there were people who lived all over the world that I was able to build strong relationships with. It was amazing for me. Once I got my camera I would go to competitions and dabble with photography by doing private photo shoots for the participants. Over time more and more people started to see my work which allowed me to branch out and start to pitch projects to companies. Matt: What was the first professional fitness gig you had? Brandon: In the photography world it’s kind of tough to say when you become a professional. It’s almost like if you get paid then you’re a professional (laughing). It’s hard to pinpoint a certain shoot where I felt that the pressure was on because each shoot gets treated the same way by me. Each job I take I put 100% of my time and effort into, you know? Matt: Was there anyone that helpful in promoting your skills or were most of the gigs sourced by you reaching out yourself? Brandon: A little bit of both. Matt Ogus, the coach I was training with when I first started to do photography would share any photos I took with his audience. From those shares I was able to get some followers of my own. Taking pictures for 3DMJ’s coaches and athletes really helped get my name out there. Over the last two years I’ve even gone outside of fitness to explore different types of photography. One of the people I’ve really connected with is Benjamin Von Wong who does a lot of what I’d call epic photography. Every shoot is not only dangerous, but very challenging as well. For one of his shoots he put himself at the corner on the roof of a 50 story building in San Francisco. He was literally hanging over the edge to take his photos. Doing this photography work outside of fitness has really allowed me to be creative and try new things. It allows me to constantly grow as a photographer as well as with the video work that I do. Matt: So you’ve worked with some awesome brands in the space such as 3DMJ, SF Crossfit, The Strength Athlete, and more. What was working with these fitness influencers like for you since you came from more of the consumer side of the market? Brandon: They were all great. San Francisco Crossfit was one that was really special for me because I’d watched Kelly Starrett and Mobility WOD videos for a long time. It was a shoot that I’d always wanted to do. I reached out on my own and was lucky enough to take pictures with the team. Stepping in the gym, which I’d seen on dozens of videos, was very surreal for me. Denovo Nutrition is another one that I’m always excited about because they are a company that I can experiment with. They give me an open playing field and tell me if I have an idea to just go for it. That relationship just means the world to me. Everyone I’ve met and worked with so far has been incredible and helped me move my career forward. Matt – Are there any photographers or video work done in the fitness space that you’ve watched and enjoyed over the years? **Brandon:**There aren’t many photographers in the communities I’m involved with. There seems to be a line between the general fitness world and the online fitness communities which I have more of a background with. I just haven’t met many other creative people in the space so there hasn’t been much of a chance to learn from other work being done. I do draw a lot of inspiration from a lot of photographers who are in that general fitness space because there are so many that are extremely talented and experienced. However, since there is only so much you can do with fitness photo shoots I do have to look outside the industry most of the time. I really like when photographers are able to connect fitness to something outside the space, like lifestyle for instance. It takes a lot of talent to connect the dots between these different areas or interests. That’s actually what I’m interested in doing on a bigger scale with large companies in the fitness space. Right now everyone seems to be doing the same photo shoots over and over so I’d really like to help put out something new and different. Matt: When you meet someone that you might be interested in doing work with what do you do to move the relationship forward and build trust? To add to that, what do you think are the benefits of working with you compared to another photographer? Brandon: When I meet someone for the first time I very rarely let them know that I do photography. I might mention that I do some work in the space, but I’ll never start pitching anyone right away. It’s important for me to build a relationship with the the person and get to know them further. I think this is a better approach because when people choose someone to work with they tend to choose the individuals they trust and have a relationship with. In regards to working with me compared to someone else, I think it really helps that I have a background in bodybuilding and am able to understand what my clients are looking for. I speak the language. I understand not only what the athletes are looking for, but also what will appeal to their audience because I’m a part of that. It’s important to me that all parties involved end up happy with the final product. This gives me a huge advantage. Matt: What else are you working on improving with your creative skillsets right now? Brandon: I’m always trying to do personal projects to advance my own skills. Many times this has nothing to do with fitness. There’s so many different aspects of photography to experiment with and perfect that I haven’t spent time on yet. Self-portraits are a great outlet for this, but I usually don’t have any trouble finding someone to try things out with. I usually am experimenting and trying something new every single day. Matt: You’ve been able to travel a little bit through your business which is awesome! What are some places that you’re excited to visit and shoot? Brandon: In April I’m going on a trip with a team of people from the East Coast to the West Coast on a two week tour for multiple workshops. I’m not sure if I can say who this is yet (laughing). We’re going to be riding in this big van with the coaches and athletes and my job is to document the trip through photos and videos. I’m really excited about this and for whatever opportunities come up in the future. Matt: Thinking long-term, what are your goals with building a career in this space? Brandon: I kind of look at my life from one project to the next. Obviously I’d like to continue to work on bigger opportunities as a I move forward, but it’s more important for me to become a better artist and to have a great balance with work, training, and all of the other great parts of life. I do have big goals I’m working towards, such as a photo shoot with Red Bull and Nike someday. Other than that I just want to continue to branch out and explore my interests along the way. Matt: What would you like to see more of in the fitness industry as it continue to grow and move forward? Brandon: As someone that comes from the consumer side of the industry, I think that fitness professionals and brands should show more interests outside of fitness. Bryce Lewis, who’s a mutual friend of ours, is a great example of someone who does this very well. Most of the people I see, especially in the bodybuilding space, seem to be a little too focused on fitness when there is so much more to life outside of all this. If you expand your interests and hobbies it opens up opportunities to get more from life. With me, in particular, looking outside of fitness and exploring different hobbies has really opened my mind. It keeps me going. These are the things I stay up at night thinking about, you know? These new projects that continually challenge me over and over again. So, I think being passionate about something outside of just fitness would help anyone in the space. Connor Browne is the lead Strength and Conditioning Coach for Essex Cricket Club and the founder of Tenax Performance. Prior to holding these positions, Connor has worked in a variety of professional sporting organizations in his career.